Here we go again... it seems the moment one major theater of war is winding down (Syria) another could immediately take its place. President Trump's late Sunday evening all caps tweet warning of "consequences the likes of which few have ever suffered before" if Hassan Rouhani continues threatening America came on the heels of US Secretary of State Mike Pompeo's "Supporting Iranian Voices" event held at the Reagan library in California in Simi Valley. 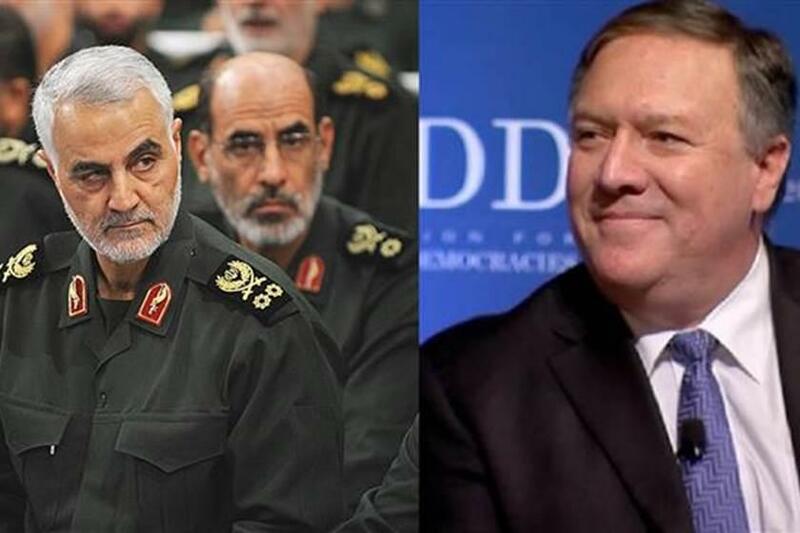 As we noted not only did Pompeo announce plans for a US-sponsored 24/7 Farsi-language channel to combat Tehran's "fake news" while promising to back what he described as "the long-ignored voice of the Iranian people" — but he likened Iran's clerical and military leadership to an elite "mafia" who've amassed vast sums of wealth while allowing their people to starve. "The level of corruption and wealth among regime leaders shows that Iran is run by something that resembles the mafia more than a government," Pompeo said. At a moment the US prepares to ramp up economic sanctions on Tehran after withdrawing from the Iran deal while pressuring European countries to do the same, Pompeo said the country’s religious leaders were "hypocritical holy men" and added the regime "has been a nightmare for the Iranian people". The Secretary of State said in reference to recent economic protests that spread through major cities earlier this summer, and larger political protests that took hold in January: "And the United States under President Trump will not stay silent either. In light of these protests and 40 years of regime tyranny, I have a message for the people of Iran: the United States hears you. The United States supports you. The United States is with you." He added further that the government has "heartlessly repressed its own people’s human rights, dignity and fundamental freedoms". Pompeo's speech, which was promoted widely in State Department official statements and through US government social media accounts, was vaunted as one in which Iranian-American dissident voices would let their voices be heard; however, video of the event doesn't appear to show that the mainstay of that community was in attendance. Multiple reports noted in the run-up to the "Supporting Iranian Voices" speech that an estimated 250,000 Iranian-Americans live in southern California, but it doesn't look like even so much as a tiny fraction bothered to show up. The whole initiative was a clear attempt to drum up enthusiasm among and for an "opposition in exile" type movement characteristic of the infamous "Iraqi National Congress" that aligned with the Bush White House to sell the public on war in Iraq in the run-up to the 2003 invasion. In a televised address prior to the US Secretary of State's speech on Sunday, Iran’s president Hassan Rouhani warned the US not to threaten the nation’s oil exports and cautioned the US that a conflict with Iran would be "the mother of all wars" while also alluding to the possibility of a peace agreement. Trump's late Sunday tweet warning that Iran will "suffer consequences" the likes of which few have seen came in direct response to Rouhani's remarks. Iran has since responded directly to the Pompeo speech. Iranian Foreign Ministry spokesman Bahram Qasemi told the Tasnim news agency Monday that it "was a clear interference in Iran’s state matters," according to Reuters. "Such policies will unite Iranians who will overcome plots against their country." Previously in the weekend to this latest dust up in rhetoric, Reuters reported that a campaign is underway to foster anti-government sentiment among the Iranian populace, which is said to involved "more than half a dozen" former and current US officials. Perhaps picking up on these recent reports, or at least sensing that talk of regime change is in the air and intensifying in Washington policy circles, Rouhani also said on Sunday,"You are not in a position to incite the Iranian nation against Iran's security and interests."